Pamper yourself with fun and luxury at the famed Boston Harbor Hotel, offering top-rated waterfront accommodations overlooking Boston Harbor. Make no mistake - BHH, as it's called locally, is one of the city's most luxurious hotels, but it also manages to combine glamour with the internationally renowned Boston Wine Festival and fun with its popular Summer in the City events. Back in the "Big Dig" days, BHH felt slightly isolated from Boston's main pulse. It originated as part of a $193 million project to revitalize historic but crumbling Rowes Wharf, a brave pioneer on the mostly-neglected harbor side of the city. Now, with the gorgeous Rose Kennedy Greenway parklands replacing Big Dig construction in front of the hotel and all the new Fort Point and South Boston Waterfront restaurants just a short walk away, the Boston Harbor Hotel is at the center of action in one of the liveliest parts of the city. However, an ideal location and luxurious furnishings are only part of the equation. What sets BHH apart is its personalized service from a wonderful hotel staff who focuses on making sure you get the most from your visit to Boston. Convenience - You're steps away from Boston's Financial District, and close to the Freedom Trail, the North End, and Boston Harbor Cruises. Harborwalk, behind the hotel, gives you a great way to explore the waterfront. 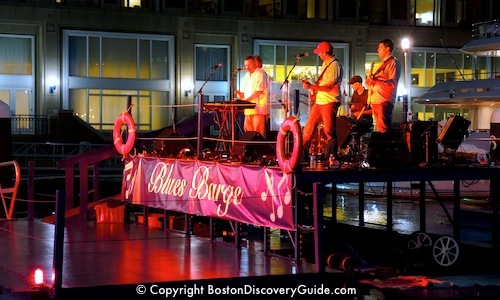 Summer in the City - On summer evenings, enjoy the live waterfront concerts from the "Blues Barge," plus the moonlight movies series. The hotel's spacious 230 rooms and suites occupy the 8th through the 16th floors of the distinctive building. 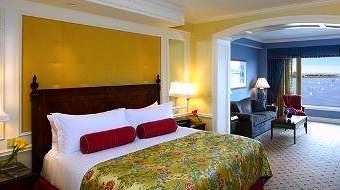 Guest accommodations befit a Boston luxury hotel . . . flat screen plasma TVs, Bose Wave radio/CD players, luxury toiletries, marble baths. And, no need to pack an umbrella - you'll find one in your room. If you're coming with your children, you'll be happy to know that BHH is one of the most kid-friendly Boston hotels. When you arrive, the hotel welcomes them with special amenities packages. Children will also enjoy the hotel's games, toys, and cribs. 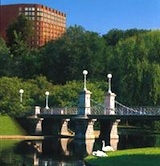 If you're looking for a pet-friendly hotel, Boston Harbor Hotel excels in this area as well. Your pet will be greeted with its own amenity package. Planning to arrive by yacht? Check with the hotel about guest space in nearby Rowes Wharf Marina. What's the easiest way to get to BHH from Boston Logan Airport? 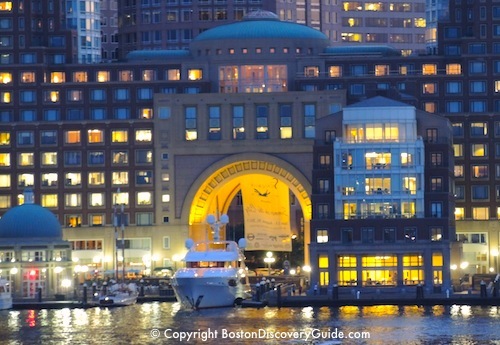 Take a 7-minute water taxi ride across the Harbor to Rowes Wharf next to the hotel. BHH's spacious public areas are filled with gorgeous Italian marble, elegant carved furniture, lush carpets, and flowers. Don't miss BHH's extensive selection of antique maps of Boston Harbor and Massachusetts Bay dating as far back as 1651 from the Norman B. Leventhal collection. 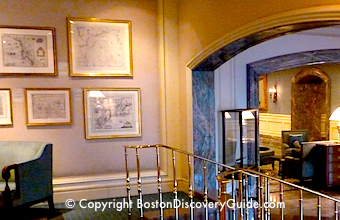 The hotel displays approximately 90 maps, and you can see more in the Boston Public Library.